This Memorial Day we honored our fallen heroes at the Florida National Cemetery in Bushnell, Florida. Florida National is the second largest national cemetery in the country, with Arlington National Cemetery being the largest. The landscape is lovely and serene with many walking trails and areas shaded by majestic oak trees. A flyover by Ye Mystic Air Krewe kicked off the ceremony. Steve Jerve, Tampa NBC Channel 8 weatherman, performed as Master of Ceremonies. The Hernando High School Bank provided patriotic musical selections. The posting of the colors was performed by the Sumter Correctional Institute Color Guard. Keynote Speaker Mike Prendergrast, COL USA (Ret), Executive Director of the Florida Department of the VA commemorated our fallen heroes. Nearly 500 cyclists from the Tampa Bay Chapter of the Defenders Law Enforcement Motorcycle Club roared up I-75 to attend the Memorial Day ceremony. 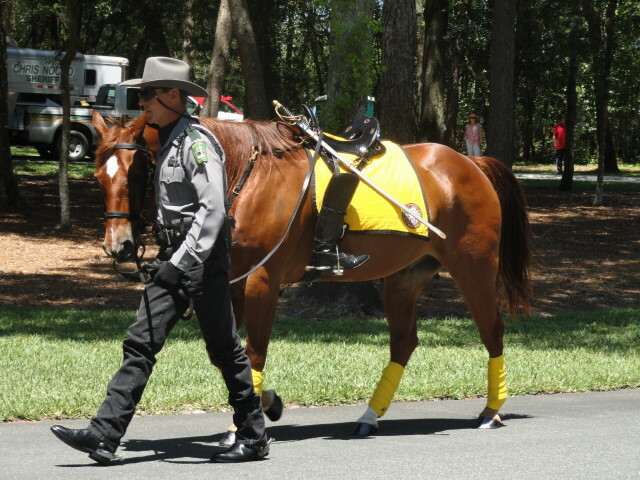 The Gun Salute was performed by the Sumter Correctional Institute Rifle Team, and the Riderless Horse presented by Deputy John Bushell & The Posse of the Pasco County Sheriff’s Department. It was a beautiful day to gather an honor our friends, family, and loved ones who paid the ultimate price to secure our freedom. They are gone, but will never be forgotten. For a slideshow of photographs of the event, click here.